1. (+) Emerson, the protagonist - Loved her! Witty, sarcastic, and strong while still being vulnerable. My heart reached out to her whenever she talked about how seeing time slips made her feel and her parents's deaths. Also, she's a tad cocky when she talks about being fearless, but she truly is rather brave and decisive. 2. (+) The Idea - When the summary says "the best of both the paranormal and scifi" genres, it's honestly true. I also think that who the blurbs are from give you a good hint -- Emerson has the snark of Sophie Mercer from the Hex Hall series while Hourglass, as a whole, has that part sci-fi feel (but not the dystopia) to it that Across the Universe had. Die-hard sci-fi fans may not enjoy the explanations behind the time-travel--because there aren't that many/when one of the characters brings up theoretical physics, Emerson doesn't want to hear about it--but people like myself who aren't averse to sci-fi will enjoy it. And paranormal fans. 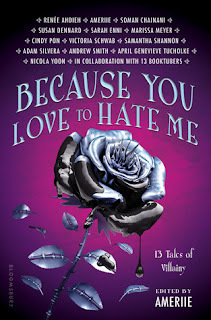 The world Ms. McEntire's created allows for more abilities to be explored in future, and plus, when you say paranormal in YA, nowadays that also includes some sort of steamy romance... and this book has got plenty of that. 3. (+) The Romance - Even though two incredibly awesome romantic interests are introduced, only one of them actually has a chance. Yay! Not a love triangle but a way to explore the dynamics of all the characters' relationships and get the main interest to act. The tension throughout the novel is palpable, and I look forward to seeing more of the physical/emotional chemistry explored. 4. (+) Side Characters - I loved the fact that Ms. McEntire introduced a select few to her cast of characters, because I feel like almost all of them were developed well. Michael and his temper & hero complex. Kaleb and his avoidance/barrier via player habits. Thomas and Dru - well maybe you don't exactly know all their flaws (except for maybe a desperation, based off of who Thomas has hired in the past to help Emerson) as well as the others, but they add a nice family touch. I hope to see Dune and Nate developed a bit more. 5. (+) The Villain - Wow. Ms. McEntire throws you for a loop here. Definitely did not see this coming, but yep, the villains are creepy and authentic, not the typical storybook brand. 6. (+) The Ending - Yay, no gigantic cliff-hanger! There is still unresolved tension, yes, but the ending is my type of ending. The one where you know the consequences of what happened in this book will be explored in the next but without you wondering what the eff just happened... because this book actually is complete--the characters do what they set out to do and not some lame, halfway version of it either. 7. (+) Emotional Realism - By this, I mean I never once doubted Emerson's struggle to cope with what was going on. Or with her parents's death and her survival. Or her older brother's concern for her. Or with her ability to connect with Kaleb. I liked that she used sarcasm to deflect from herself, that she was vulnerable while still acting with lots of courage. 8. (+) Pacing - Though it takes a while for the main action to occur, I was still hooked from page one. I literally picked up this book, only wanting to read the first chapter but not stopping until the very end. 9. (--) Confusion - Okay, time-travel novels always screw with my head and I'm still a little confused about certain aspects. I always wonder about the circular notion of it... and there's also the question of what exactly Michael saw? because how else would it be possible for him not to... I'm going to stop now before I spoil the book for you guys. Also, I'm wondering about that electricity effect between Michael and Emerson. Sometimes it seemed really intense and other times, when there was more physical contact, it was less intense. I don't really understand what's going on there and hope that's explored a bit more in future books, especially with the whole Liam/Grace deal. In defense of the book, however, the confusion about the time-travel just made me think more about the novel, and you know it's a good book when you can't get it out of your head. 10. (--) The Cover - looking back on it, I think that I originally liked this cover. I thought it was different and a nice twist, and when I looked on Ms. McEntire's website, I saw the trailer for the cover release and thought it was even more appropriate.... But now, after finishing the novel, I feel like the cover is drab and doesn't quite capture the glory within the pages. I mean, what is Emerson really doing? She looks like Trinity or Neo from the Matrix with that stance/going up the wall, but it doesn't tell you about the book really. Also, the more I look at it, the more that girl's neck freaks me out. 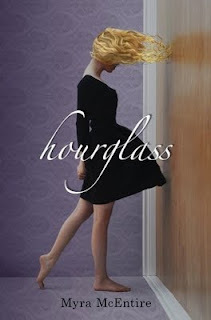 Loved the romance Ms. McEntire created in Hourglass and can't wait for more of the time-travel aspects to be explored! ahh I love your reviews so much!! I've got this to read and it sounds amaaaazing. It's next on my list for sure! Yay! Thanks Cait :). I really hope you enjoy it! I was definitely still thinking about it hours after I finished reading it. i'm so glad i came across your blog! i love it. i want to read this book quite badly, too. as soon as i can, i'll probably be getting it. just sounds so intriguing! Fascinating!! After reading the summary of 'Hourglass' and reading your review, the story has peaked my interest. In both sci-fi and paranormal genres, which I love, I found the story intriguing. It is already bad enough that teens are confused as it is growing up. I will definitely have to add this to the TBR list that my daughter and I share. Many YA books that I have encountered and read, I have passed to my daughter to read. Being a teen herself, she may relate to some or all or none of the characters. But, we do end up discussing these books after reading it. Thank you for sharing! Loved the review. I agree with you on Emerson and the situation of the book. When I read Hourglass, Emerson was brave, and witty. She was great. This book was definitely different, even though it took me a while to grasp the characters' abilities.